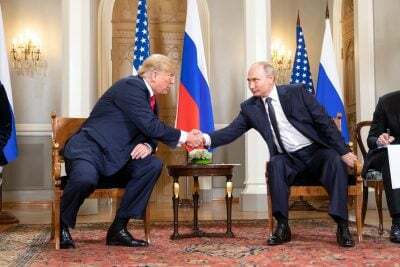 Helsinki Summit: Road to World Peace? “As nuclear powers, we bear special responsibility” for international security. Putin said Russia (as a devout Christian country) considered it necessary for the two countries to work together on nuclear disarmament and non-proliferation – and to avoid weapons being placed in space. Donald Trump correctly reiterated the significance and importance to hold a meeting with Vladimir Putin, despite the wide spread criticism from within his own Country and most notably from the mainstream media who are very now clearly controlled entirely by what has popularly become known as the ‘Deep State’. “As President, I will always put what is best for America and what is best for American people,” Mr Trump said. And what was the response in America to the summit? The most vitriolic insult came from former CIA Director, John Brennan. The not so funny irony is that Brennan literally voted for the then Soviet Union dominated US Communist Party to take power in the United States of America. Incredible, almost beyond belief. If you look at Brennan’s extremely insulting tweet repeated below, the full irony of his being a communist in the Soviet era should hit home. So what are the facts? Well John Brennan was accepted into the CIA in 1980 even though he admitted voting Communist in 1976. Something inexplicable and astounding for any thinking person to understand of itself. President Obama’s CIA chief, John Brennan, first publicly revealed this at the Annual Legislative Conference of the Congressional Black Caucus, on 15 September 2016, in Washington DC, saying that when he had applied in 1980 to join the CIA, he admitted to them that in the 1976 Presidential election, at the height of the Cold War against the ‘Godless’ Soviet Union, when a strong Christian candidate, Jimmy Carter was running against Gerald Ford, Brennan had voted instead for the candidate of the US Communist Party, Gus Hall, and that he was then greatly relieved to find that this information didn’t cause rejection of his CIA-application. One must ask why as it happened 11 years before ‘the alleged’ end of the Cold War by the West in 1991. The Caucus made no mention of Brennan having spoken there, nor did the CIA include in its public archives any indication that he had spoken there, though, for example, they did include the complete transcript of “Director Brennan Delivers Keynote at Miles College” on 13 September 2016, in Birmingham Alabama, at which event he said nothing at all that the main stream media considered was newsworthy; incredible! Furthermore, though there is online a webpage devoted to, and covering each day of, the 2017 Annual Legislative Conference, on 20-24 September of last year, the webpage for the 2016 Conference, on September 14th-18th, mentions events only on September 14th and September 17th, as if Brennan hadn’t even appeared there at all. The entire day’s events on September 15th are missing. So: both the Caucus, and the CIA, redacted his 15 September 2016 presentation, and the transcript of it isn’t publicly available neither is any video or audio of it available publicly. At the risk of being repetitive, take this in; John Brennan literally voted for the Communist Party, the Soviets, to take power in the United States of America! The Soviet Union no longer exists and lasted less than a 100 years. Its Russia a centuries old deeply Christian nation. As a Brit, a keen observer of American politics for decades, I find it astonishing that a father and son, Americans Ron and Rand Paul seem to be representative of a few sane voices that debate logically and objectively on the subject of Russia, acknowledging, as Trump put it, that they are our competitors not enemies. On Monday on CNN, committed Zionist, the famous Wolf Blitzer, was aghast that Kentucky Sen. Rand Paul spoke on his programme saying that critics of Trump, Putin summit have “Trump Derangement Syndrome”. I feel compelled to quote the Senator’s father from a few days ago, the former Congressman and medical Dr. Ron Paul, who himself described the phenomenon we call the ‘Deep State’ best when he said ‘the ‘Deep State’ is no vast and secret conspiracy theory. It is real; it operates out in the open, and it is far from monolithic. The ‘Deep State’ is simply the permanent, unelected government that continues to expand its power regardless of how Americans vote. There are hundreds of billions of reasons dollars mostly, why the Beltway military-industrial complex, the EU and even Israel is terrified of peace breaking out with Russia and will do whatever it takes to prevent that from happening. So from the outside as a Brit, the question I ask is why haven’t the Clintons, Brennan and their like been arrested already for the countless crimes that have been revealed to the public… with evidence? I ask because it is only when these spoilers and traitors are brought to justice that America can come to peace with itself. Constant wars are not the answer to stability. In the words of Winston Churchill, and I paraphrase, “Jaw, jaw, jaw not war, war, war” is the solution.